The Dwight D. Eisenhower National System of Interstate and Defense Highways, or simply the Interstate System, was designed and defined in the 1940's and 1950's. Designed after Germany's Autobahn system, the Interstate System was built around the idea of multiple interconnected, high-speed, limited access highways to connect America's major cities. To avoid numerical duplication, the way the Interstates were numbered was reversed from the US Highway system. They were numbered west to east, south to north. Interstate 5, the current lowest number assigned in the system, runs from the Canadian border in Washington state to the Mexican border in California. I-95, on the flip side, runs from Miami, Florida to the Canadian border in Maine. Like the US Highway system, the Interstate system also allowed for auxiliary and bypass routes, however the numbers are assigned differently. 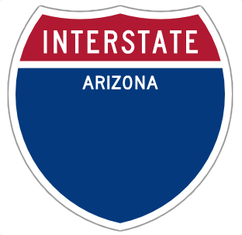 All auxiliary Interstates are three digits and may only run within one state. These roads have been nicknamed 'intrastates', as they are not allowed to cross state lines. This allows for each state to have nine auxiliary routes per parent route. Unlike their US Highway counterparts, the first digit in an auxiliary Interstates' number does have deeper significance. Typically, routes beginning with an even number is a bypass route, splitting off the mainline to run through a town or business district, and rejoining it's parent route later on. Routes beginning with a odd number are usually spurs. These can lead to a different destination and in a completely different direction. These rules, however, are not always followed. I-210 in California, for example, should theoretically be a bypass around the Inland Empire of I-10 but it's actually a spur, running from I-5 in Santa Clarita to I-10 in Pomona. Also unlike the US Highway System, Interstates have 'chargeable' milage. The chargeable miles were financed with federal money and are given more federal maintenance money over their non-chargable siblings as they are considered more important for interstate trade. There can only be 42,000 miles of chargeable interstates in the country, with larger states (both in population and land area) receiving more milage then smaller states. Most two digit interstates are chargeable, while some three digits are as well (for example, I-405 in California is chargeable). Header image courtesy of Southern California Regional Rocks and Roads.